Slowly but surely, we made our way to Tarangire National Park. Our itinerary on our overland truck trip through Tanzania in 2006 bypassed this park as well as Lake Manyara, and we were excited to finally get a chance to explore them both. At Tarangire, we stayed just a few kilometers from the main entrance of the park at Zion Public Campsite, a basic but pleasant enough place to pitch a tent. After unloading the car, we eagerly headed into the park for our first game drive. 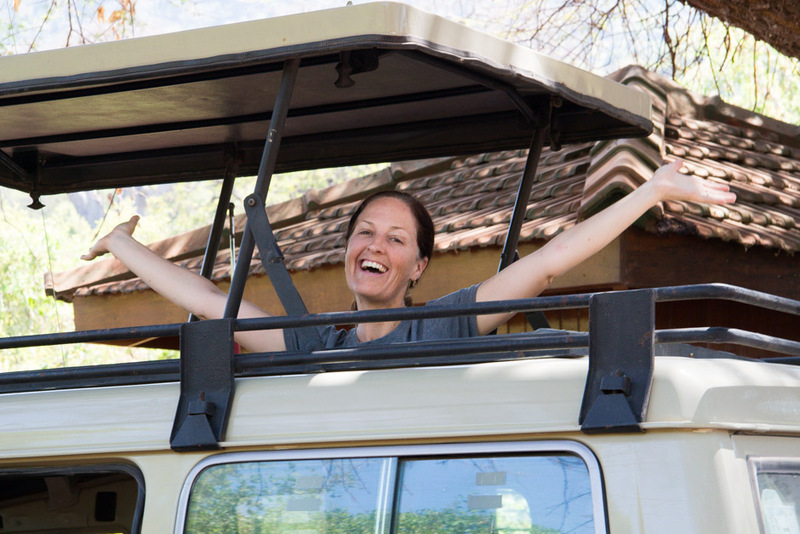 Tarangire is supposed to be at its best in the dry season when you can spot large numbers of elephants, zebras and wildebeests, and we were greeted by all three species within minutes of driving through the security gate. We also spotted lots of impala, some giraffe and the odd waterbuck during our time in the park. The park is also an excellent place for spotting birds, and we got some nice looks at tawny eagles, Verreaux’s eagle owls and pygmy falcons. We also had good sightings of the yellow-collared lovebirds, Nubian woodpeckers, the striking lilac-breasted roller, as well as many other species. Twitchers rejoice! 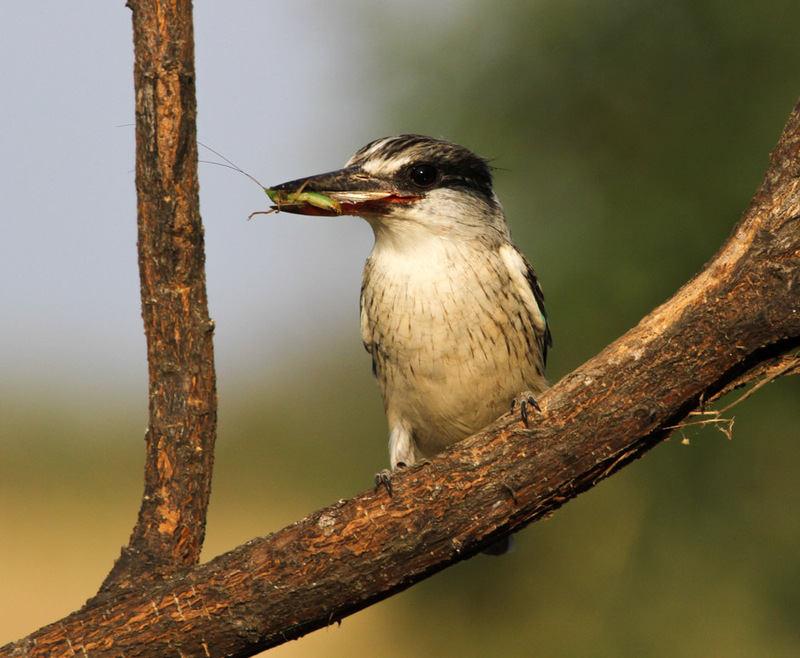 One of our favorite bird species is the kingfisher. We were so excited when we came across this woodland variety who had just caught a tasty dinner. Matt managed to get off a single shot before the bird swallowed his dinner in one large gulp. On one of our morning drives, we stopped by a watering hole to check out the action. Much to our delight, we spotted three cheetahs napping in the shade of a nearby tree. The tall grasses kept them mostly hidden from our view, but, with the day still young, we decided to wait around and see what might transpire. The first visitor was a warthog who opted to take advantage of the cool morning temperatures for his daily mud bath. After satisfying his thirst, he found the perfect pool and enthusiastically plunged in. It was amusing to watch him cover every inch of his body with the thick, natural sunscreen/insect repellant. Next, a herd of zebra and wildebeest approached, and the cheetahs’ heads popped up. We hoped we might see some action. Eventually, we did, but it wasn’t exactly what we had been expecting. A roving troop of baboons invaded, and, as soon as the cheetahs were spotted, the largest males took exception and sent them packing. It was quite a sight to see the larger cats chased off by the scrappy simians. Tarangire is known for its abundance of elephants, so that was one animal our guide, Mansour, guaranteed we would see. Among our favorite encounters were hearing one hungry elephant tear down a small acacia tree for a mid-morning snack and watching two juveniles trunk and tusk wrestle with each other in a playful manner. Nothing, however, was quite as humbling as having a herd of the huge pachyderms pass silently within a few feet of our Land Cruiser. The fact that such large animals can move without making a sound never ceases to amaze us. One of the most pleasant surprises of our camping safari was the exceptional food. Mandela, our cook, wowed us meal after meal with surprisingly inventive creations that you wouldn’t imagine possible in a simple bush kitchen. In the first few days of our safari, he treated us to homemade breads, vegetarian moussaka, delicious soups and tasty salads, all made with fresh, simple ingredients. After twelve straight days of hearty trekking meals, we were psyched to be spoiled by Mandela’s superb safari cuisine. If you’re going to get a flat, lucky it happened outside of the park! Looks like you were well taken care of and once again got some incredible shots. Unfortunately, it was just the first of many, many flats for us. When we were in the Serengeti, we had three in one day, and we even got one when we were racing to get out of the N’gorongoro Park gate before our pass expired on our very last day. Thank you for following along! You all look so relaxed after your long hikes. Great shots! You are so right, Andy. It was such a relief to have Kili and Meru behind us. Safari was the perfect reward for all that hard work. Thanks! Love all the animal drama! The photo of the elephant checking you out as he passes by is pretty awesome! Elephants are so cool, but it does make me a little nervous when they pass so close to the car. Their size is mind-blowing!